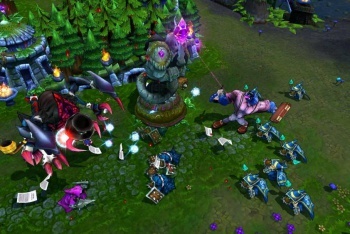 The Heroes of Newerth hacker may go after League of Legends next. When Heroes of Newerth, the fantasy theme multiplayer combat arena game, got hacked earlier this week, the person claiming responsibility popped up on Reddit to hold an impromptu Ask Me Anything. In the course of the conversation he claimed, among other things, that Valve was an easy target, and that "I guess I'll do LoL next, as this was so funny." The alleged hacker - according to his own report, a security network engineer in Belarus - did it for kicks, he claimed; he doesn't play the game, and only went after Heroes of Newerth because a friend on IRC suggested it. When asked why he'd done it "for malicious intent" rather than, say, giving everyone tons of gold, his response was "how would that have been fun?" He was willing to tell people how the hack had been achieved, but not until the developer had patched the exploit. "They still haven't," he claimed. For those wondering whether Valve is next on the hit list, though he does claim "it wouldn't be too hard to compromise them," he hasn't seriously looked at the problem yet. He's getting too much fun from his current exploits to start planning others. The full text of the AMA can be found here.